As you read this blog I am somewhere in Rome, Italy or possibly traveling from Rome to Athens, Greece. My wife and I left Tampa on the 4thto see my son Thomas, TC grad 2016, and his Oklahoma State basketball team play games in Europe. As you can imagine with our TC season being the same time as college basketball I just haven’t had very many opportunities to see my son play and now that he is a junior I want to take advantage of every opportunity that I have left and thus here we are in Rome. Our first stop was Venice for 3 days, now Rome, and eventually Athens. 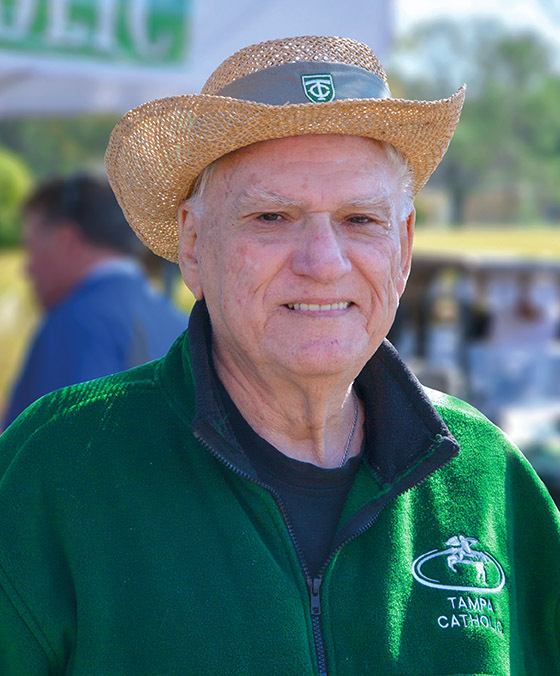 We were all saddened by the passing of TC icon Nick DiMaggio. Nick was at Tampa Catholic since 1964, coaching (2 state track championships and over 50 individual state champions) and being the AD, with TC winning state championships in baseball (8), softball (2), and basketball (2). Nick loved Tampa Catholic so much he was buried in a green TC jacket. I was humbled and honored to be asked to give the eulogy at his funeral Mass at St. Lawrence, as well as be one of the pall bearers. Nick will be greatly missed by all of us. We named Jeris McIntyre TC'99 as our new head football coach this past July. Jeris takes over for Mike Gregory, who accepted a college coaching job in Arkansas. Jeris is a TC alum who went on to play college ball at Auburn and then in the NFL with the Kansas City Chiefs. Jeris has been on the TC coaching staff for the past 3 years and has stepped right into the job with energy and passion. Expect great things from this team this year. I also want to publicly announce that Adriane Wunderlich has accepted the position of track coach. Adriane is our cross-country coach and was an assistant track coach last year. She taught part time last year but now will be a full time faculty member in our Theology department. We couldn’t be happier with her taking over the track program as she did great things with our cross-country program last year. Tampa Catholic has a top NBA draft pick. Kevin Knox, 2017 grad, was selected 9thin the June NBA draft, the highest draft pick ever from Tampa, by the New York Knicks. Kevin played one season at Kentucky before entering the draft. He just completed a great NBA summer league in Las Vegas as he made the first team all-summer league team. We are all going to have to become NY Knicks fans as he carries the TC banner forward. We are so proud of what he has accomplished and know that this is only the beginning to a great NBA career. Following up on Kevin in the NBA, I’m happy to tell you that the current edition of the TC basketball team finished their summer league by winning the Hillsborough County championship. The team only lost one game in the summer league, and that was to Wharton, the team that we defeated in the championship game a week after the loss. It was a great summer for the team. Remember we are all helping to develop champions; on the field of play, in the classroom, and in the community. Your support is greatly appreciated. GO TC!